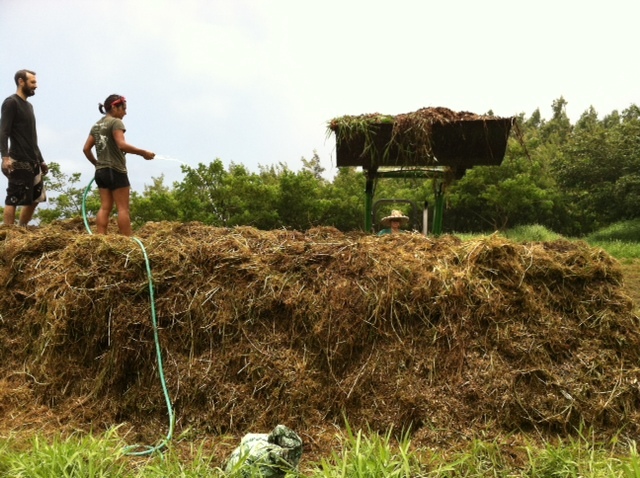 We make our own compost here on the farm for the health of our bamboo, nursery plants, and food crops. It is so rewarding to make our own humus, organic matter that creates the conditions necessary for microorganisms in the soil to thrive, in turn allowing our plants to be strong and healthy. 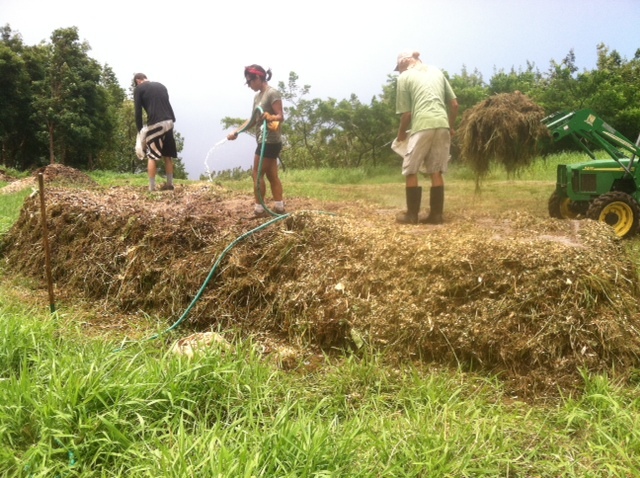 Apprentice Coordinator Seth Raabe led his Ola Honua Apprentice crew in making a compost pile on a beautiful August day. 1. First, we chose our site, a large flat area easily accessible to a tractor, with a water source nearby. Since we’re building a large heap, we’ll be bringing woodchips and grass mulch to the site using a tractor, fueled by locally made Biodiesel. A nearby water source is important because wetting each layer as we build the compost will activate it. With the right amount of water, the compost heap will “cook”, or heat up, which kills weed seed, soil pathogens, and plant diseases and makes good “clean” humus. 2.We put down a layer of woodchips at our chosen site, and added water, setting the foundation for our pile. 3. A thick layer of grass mulch followed. 4. We added homemade IMO (Indigenous Micro-organisms) over the grass mulch layer. The IMO will inoculate the grass mulch layer and spread throughout the compost heap. And of course, we watered thoroughly to activate. 5. Next, we added another layer of woodchips, and evenly spread over the woodchips a bag each of Calprill and Seabird Guano, both Certified Organic soil supplements. And, again, water. Success! 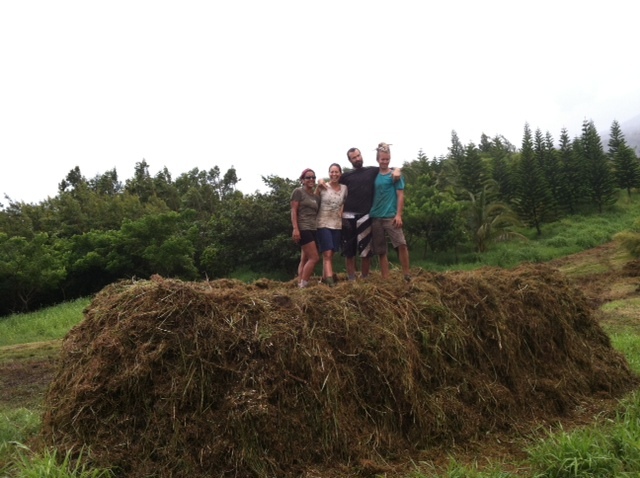 A completed compost pile that will feed our soils! Next, we will need to turn the pile to keep the temperature between 130* and 150* F. It will usually get turned three to five times over the course of two months.